By Nick Meynen. EJOLT collaborators Marc Ona, Silas Siakor and Pablo Fajardo have one thing in common: they once won the prestigious Goldman Environmental Prize. This award helps grassroots environmental heroes to continue and expand their environmental justice struggles. Last night, the 2016 winners were announced. It shouldn’t come as a surprise that many of the struggles of such pioneers are covered in our Atlas of Environmental justice. From Sofia Gatica’s legal fight against Monsanto in Argentina to Medha Patkar’s struggle against the Narmada Valley dams in India. Or from Nohra Padilla in Colombia to the recently murdered Bertha Cáceres in Honduras. So when the latest winners were honoured at a ceremony in San Francisco, we paid attention to the issues they care about. Máxima Acuña stood up for her right to live off her own land, despite life threatening pressure from Newmont and Buenaventura Mining to develop the Conga gold and copper mine (for details on this conflict: check our atlas). After years of resistance, Newmont just announced that it abandons the project. Such threats need to be taken very serious. Only last month, Berta Cáceres was killed for her work to stop the Agua Zarca dam in Honduras. There’s now a long list of violence and intimidation used against Goldman Prize winners and the organizers say that this year, the ceremony was intended to highlight the need to protect activists. Zuzana Čaputová, Slovakia is a public interest lawyer who spearheaded a successful campaign that shut down a toxic waste dump that was poisoning the land, air and water in her community, setting a precedent for public participation in post-communist Slovakia. Her victory is now case law under the Aarhus Convention on access to information, public participation in decision-making and access to justice in environmental issues. In one of the most dangerous countries in the world for environmental activists, Leng Ouch went undercover to document illegal logging in Cambodia and exposed the corruption robbing rural communities of their land, causing the government to cancel large land concessions. This battle is also covered in our atlas. Then there’s Luis Jorge Rivera Herrera from Puerto Rico, who helped lead a successful campaign to establish a nature reserve in Puerto Rico’s Northeast Ecological Corridor—an important nesting ground for the endangered leatherback sea turtle—and protect the island’s natural heritage from harmful development. Destiny Watford inspired residents of a Baltimore neighborhood in the US to defeat plans to build the nation’s largest trash-burning incinerator less than a mile away from her high school. Edward Loure from Tanzania led a grassroots organization that pioneered an approach that gives land titles to indigenous communities—instead of individuals—in northern Tanzania, ensuring the environmental stewardship of more than 200,000 acres of land for future generations. 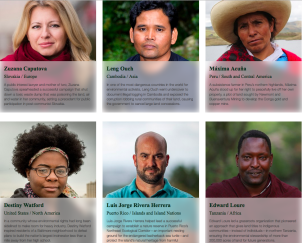 For anyone looking for inspiration on the environmental justice frontline, their stories are a very good place to start.